Increased independence brings new responsibilities and expectations that help take learning to the next level. In the 12/13s, we study the history of the United States, with a focus on exploring this narrative through a complex fabric of stories representing multiple points of view. Students explore the ways that the events of history are shaped by individuals and cultural groups and by the forces of politics, economics, geography, and technology. This rich curriculum offers many opportunities for students to enhance their skills in reading, writing, listening, speaking, using maps, charts, and graphs, and conducting research. As part of the current events strand of the core curriculum, students will choose a newspaper or magazine article, create the framework for a discussion or activity about it, and lead the lesson. The 12/13s year is a time of many changes for students. With added independence comes new responsibilities. 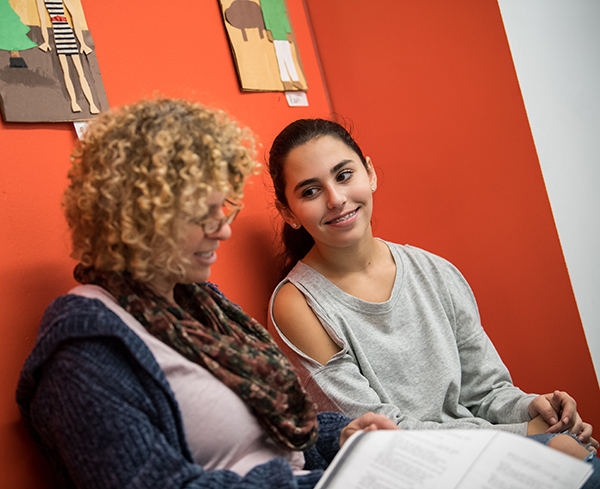 The Human Growth and Development component of the curriculum focuses on helping students make responsible and independent decisions with regard to their social, physical, and academic worlds. In literature, 12/13s students do in-depth readings of books selected because they are engaging and challenging for students at this age. Typical texts include: The Curious Incident of the Dog in the Night-Time, Romeo and Juliet, Persepolis, The Absolutely True Diary of a Part-Time Indian, Will Grayson, and Lord of the Flies. A wide range of genres lets students examine important themes through different lenses. Students in this year go beyond reading comprehension and towards interpretation. They explore complex works using performance, visual analysis, and an exploration of elements of fiction. They are introduced to the writing of essays about literature. In addition, 12/13s students are expected read independently. In the fall, they participate in Bank Street’s mock Printz Award program. In the spring, they do themed independent readings which include historical fiction and books in verse. Students write for many purposes and in many forms. In class, they often write to gather their thoughts or to process material in Social Studies and other classes. They write self-reflections, essays, journal entries, letters, and speeches by historical figures or characters. They answer comprehension questions and write responses to their readings. 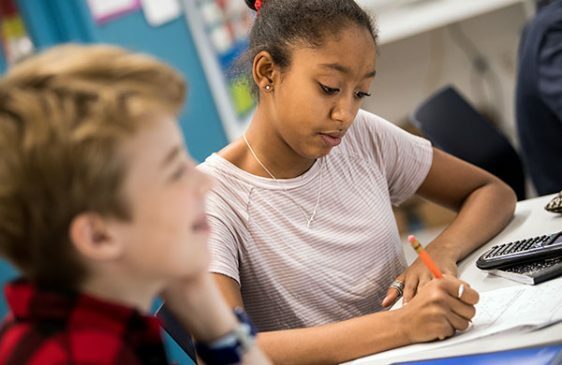 In this year, students sharpen their skills in research and hone their ability to organize the five-paragraph essay. They have many opportunities to practice both in-class essay writing and essays related to curricular content that they work on over time. In our poetry unit, they read poems that highlight aspects of specific forms and write their own poems to experiment with those elements. We work on revision and performance skills with a resident poet, culminating in a whole-grade performance at the Nuyorican Poets Cafe. In the spring students complete a major research project on a historical topic of their choice from the 19th century. Language Skills work in the 12/13s year includes completing the Wordly Wise 7 vocabulary curriculum. Students practice revision and editing skills, working independently, with their teachers, and with peers. Weekly grammar lessons allow students to practice with a concept or skill in class and at home. Students participate in the mock Printz program. Working with Bank Street’s Center for Children’s Literature, the children’s librarian solicits donations of current young adult books appropriate for 12/13s. Classroom teachers tailor the curriculum to their students’ needs. Students practice and refine their critical thinking and public speaking skills by evaluating and discussing books eligible for Bank Street’s mock Printz award. By the 12/13s year, students are developmentally ready to work with formal grammatical structures. Students in French and Spanish become comfortable with grammatical terms and usage in each language. They put their expanding vocabulary to work with more opportunities for reading and writing. In Spanish, the overarching theme of the year is a study of Spain. Students explore the cultural and geographic diversity of the Iberian Peninsula. They learn about Spain’s cities, architecture, cuisine, art, music, and festivals. As more formal grammar is introduced, students learn to correctly use verb tenses. Homework assignments reinforce grammar and writing skills. Final projects bring together the students’ knowledge of grammar, vocabulary, and culture. In French, this is the year when students begin to understand and apply grammatical structures in speech and writing. They conjugate regular and irregular verbs. They make decisions about adjective agreement and placement. They learn a range of idiomatic expressions. Grammar and vocabulary continue to be embedded in interesting content. Lessons may focus on French Impressionist Art, French cuisine, and West African folktales. Each lesson provides opportunities to speak and write creatively. Culminating projects may involve art, music, and cooking. The math program for the 12/13s is the beginning of a two-year course in algebra. The curriculum stresses the real-life applications of algebra. Whenever possible, students use manipulative materials to make abstract ideas concrete. Teachers emphasize on understanding underlying concepts rather than memorizing procedures. Operations using positive and negative numbers. Using variables and identifying patterns. A study of linear relationships. Interpreting word problems with expressions and with equations. Scientific notation and exponent rules. The 12/13s science curriculum focuses on life science. It explores the question: why we look the way we do? Students learn about physical traits passed on through the mechanics of genetics, how humans develop and reproduce, and how we relate to other organisms. 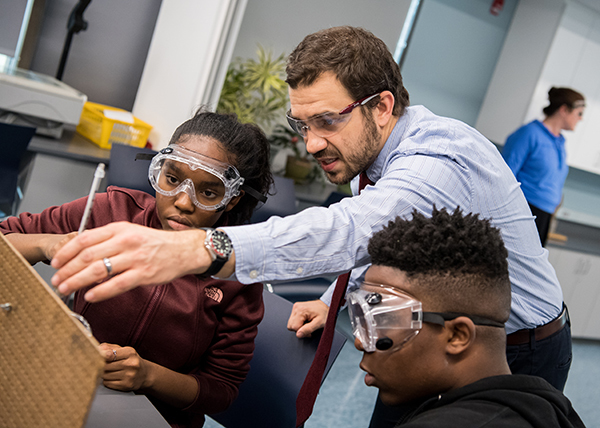 As students investigate these topics, they polish their understanding of the scientific method and develop a critical lens to evaluate information. Genetics and principles of heredity. The form and function of DNA. Using a compound light microscope. From January to early March, students work on an independent investigation into a question related to life science. They work in small groups to devise and refine an experiment to answer a question; collect and analyze data; draw conclusions based on this analysis; and present these findings at Science Expo. The Upper School technology program is developing quickly. The 12/13s classrooms use a range of technology for instruction, documentation, and collaboration. The 12/13s Art curriculum introduces students to more formal elements of art. Students work on painting, drawing, collage, printmaking, and clay. Many projects require careful observation in order to support students’ growing interest in realism and details. Students begin the year with painting, exploring the concept of opposites. They complete a three-week narrative painting/construction project based on a theme drawn from an historical event. In clay, students will create functional candle holders. During the second term, students create a series of portraits which focus on how they see themselves. 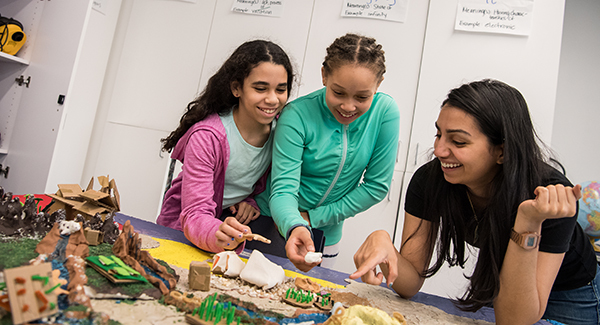 In clay, students create a relief tile of a place they know well. In the fall, 12/13s students create a site-specific sculpture. Class discussions explore the relationship between a sculpture to a site and to the public. Students learn about actual public art commissions. 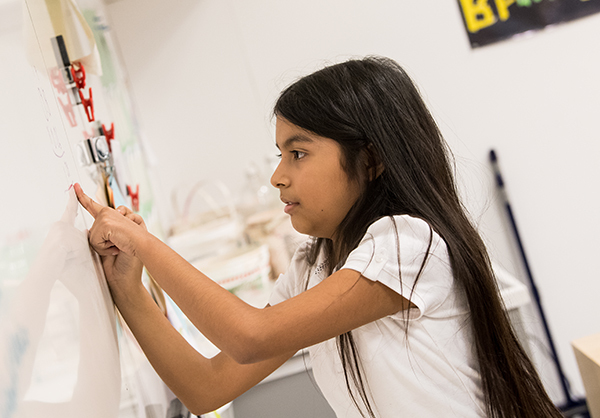 Students choose the idea for their sculpture and follow the guidelines that apply to professional artists—drawing their plan, modeling the work in three dimensions, and presenting their idea to a review panel. This project draws on numerous sculptural skills they have been developing over the years: assemblage, carving, and modeling. In the spring, students create a piece of furniture—their own stool. They work out a design that is structurally strong as well as personally detailed. Throughout the process, students solve the multiple problems that arise. They are encouraged to continually assess cause and effect as they problem-solve. Each person in learns from his/her own experiences as well as from classmates’ work. 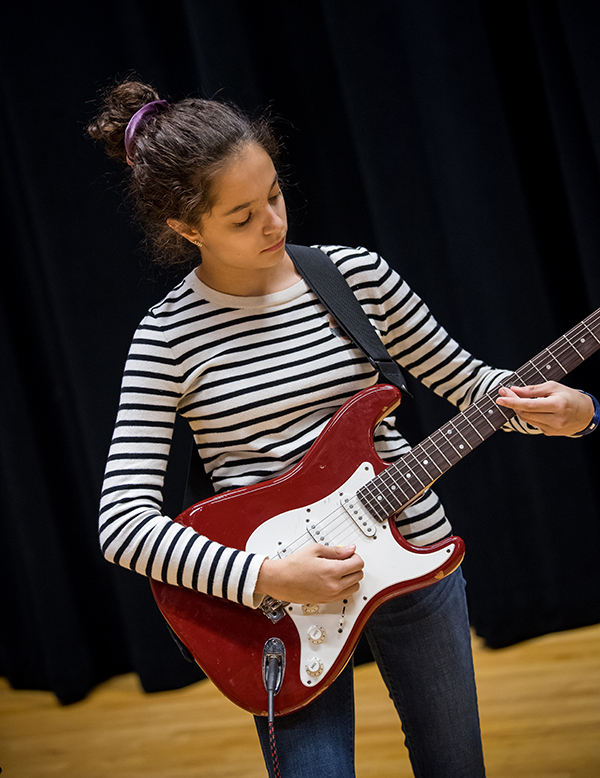 The Upper School music curriculum has three main parts: music history, music theory, and making music through singing and playing instruments. In the 12/13s, the students learn about the history of Western classical music in the fall and about jazz in the spring. They study the major eras of classical music, including the Medieval, Renaissance, Baroque, Classical, Romantic, and Modern periods. Students gain appreciation for the differences among the major eras of classical music. They learn about major figures and works in European music history. Students are assigned composers to research and they share what they learn with classmates. At the end of the classical music unit, students watch West Side Story and examine the ways that classical music, Latin music, and jazz are combined in Bernstein’s work. In the spring, students embark on their study of jazz. They learn the differences between major jazz styles such as ragtime, New Orleans, swing, bebop, and “cool” jazz. They discover how American history intertwines with the development of this American art form. We discuss the most influential instrumentalists, composers, and singers in jazz history. Students are assigned jazz artists to research and they share what they learn with classmates. The 12/13s also do more advanced ear training exercises and reinforce their note reading skills through classwork and homework. 12/13s students have gym four times per week, for 45 minutes, meeting twice per week in the gym, once on the rooftop play area, and once in a multi-purpose room for fitness activities. The program focuses on meeting the interests and capacities of all students. We strive to engage all students in every class and to make this an enjoyable, dynamic, exciting, and safe place for all children. We provide broad exposure to a wide range of physical activities to help students develop an enjoyment for movement and games that will evolve into physical activity throughout their lives. We further develop the knowledge of rules, strategy, and skill levels in activities introduced in the 10/11s. Some of the sports and activities offered include team handball, football, soccer, basketball, badminton, hockey, volleyball, softball, Frisbee, and group games. Stretching, aerobic exercises, and upper body strength activities increase fitness levels. Optional after-school interscholastic sports include soccer, softball, basketball, and track-and-field. Students also participate in cooperative games that stress teamwork, communication, and sportsmanship. Beyond building sport-specific skills, we expect students to participate with effort, practice on task, take risks, apply new and old skills in scrimmages or games, and understand rules and strategies. Students are given many opportunities to take on responsibilities for their own play. As team captains, they help with set-up and clean-up. They learn how to settle differences quickly, fairly, and peacefully. Students learn about the tapestry of multiple perspectives in viewing our nation’s history, concluding with an essay to discuss access to freedom and the rights for different groups over time.